I've been trying to do a little variety on the food blog, since seeing dish after dish of just chicken or pork could be boring. Lets see... what is left? Fish or beef. I picked fish for no particular reason other than it sounded tasty to me at that moment. I dug through my freezer and found a package of salmon I had bought a while back, and set it out to defrost. I then carried on with my day, until I decided to sit down and make out what I was going to do for dinner. Salmon, hmm. Well, lets see what Giada de Laurentiis has to say about that. A while ago I had bought her book "Giada's Family Dinners" and hadn't used it once, so I flipped through it until I saw a reasonably easy salmon dish to do. 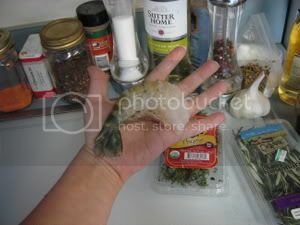 - In a small bowl, mix the garlic, both mustards, rosemary, and thyme. Mix in the wine and oil. Set the mustard sauce aside. - Preheat the broiler. Line a heavy rimmed baking sheet with foil and spray the foil with non-stick spray. Arrange the salmon fillet son the baking sheet and sprinkle them with salt and pepper. Broil for 2 minutes. Spoon the mustard sauce over the fillets. Continue broiling until the fillets are just cooked through and golden brown, about 5 minutes longer. 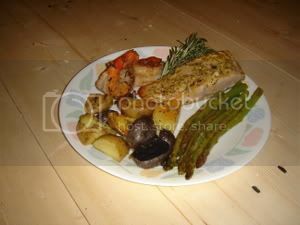 - Transfer the fillets to plate and serve with lemon wedges. Ok, so now I had my main part of the dish, now I needed a supporting cast. 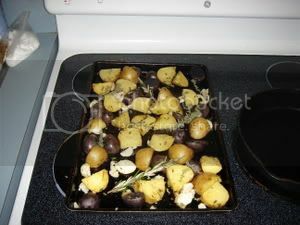 I had some purple baby potatoes I had bought a few days ago that I wanted to use up, so I decided to roast some potatoes in the oven. I didn't have enough potatoes so I bought some baby white potatoes as well. I didn't really follow a recipe here, I just kind of winged it. I decided since there was garlic, rosemary and thyme in the salmon I would add that to the potatoes as well. After a little digging around, I found generally that roasting in a 375ºF oven for 20 minutes, then adding the herbs, and roasting another 20 or so minutes should do the trick. As a side note: While I try to eat organically, I really can't afford it all the time. However, there are two items of produce that I will ALWAYS buy organically, and those are potatoes and apples. Apples since the amount of chemicals used are much higher than on other produce, and even washing doesn't get rid of all of it (and I like the peel, it has lots of nutrients so I don't want to completely peel an apple every time I eat it.) Potatoes for the reason that they (along with many other root vegetables) are doused in fungicides, pesticides and herbicides. Potatoes even more so since they are sprayed with another chemical to keep them from sprouting in the store. Ok, off my soapbox. Finally I needed a vegetable to round out the meal. I had some asparagus that I had bought that was already pre-washed and ready to cook in the bag. (I don't usually buy those, I usually buy them fresh, but they had marked the whole bag down to $1.49!) I had frozen it, so I grabbed those out of the freezer as well. I ran to the store to pick up a few things, plus a salmon fillet. My bag of frozen salmon had been wild-caught, but unfortunately the store I went to only had farm-raised salmon. 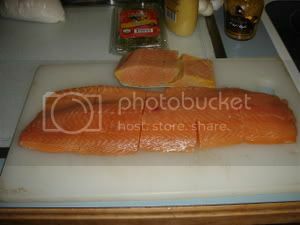 After some internal debating I decided to buy the farm-raised salmon, but never to do it again! (Note: In the farm raised vs. wild-caught salmon debate, it is much better to buy wild-caught salmon due to it's much healthier benefits. Farm raised salmon are found to have 10 times the level of toxins than in wild-caught salmon.) I also happened to pass by the fish counter, and these HUGE shrimp caught my eye! I was sufficiently intrigued that I bought 4 of them to add on to dinner. Look at the size of that! What was I going to do with it? I could stuff it I decided... but then quickly talked myself out of it. I didn't want to be cooking dinner for hours! Since the potatoes were going to take the longest (+40 minutes) I decided to get those started and put into the oven while I got everything else ready. The salmon would take only 6-7 minutes to cook, and the asparagus only about 10. After 20 minutes I pulled the potatoes out and threw in about 9 cloves of smashed garlic, some chopped thyme and rosemary, and then a few sprigs on top of that. I can't tell you how good the kitchen smelled while those were roasting. The frozen salmon I had from before was a LOT thicker than the salmon I had just bought. This meant that I had to keep my eye on the salmon while it was broiling, and leave the thicker one in a while longer to make sure it cooked all the way through. Not too terribly bad, but annoying just the same. I cut the fillet into smaller fillets, and then froze the ones I wouldn't be using tonight for another day. The asparagus I just drizzled with olive oil, balsamic vinegar, salt and pepper and threw in the oven the during the last 10 minutes of the potatoes roasting, so I knew that those two would be done at the same time. After they were finished, I pulled them out, covered them with aluminum foil to keep them warm, and put the broiler on for the salmon. As the salmon cooked, I quickly melted some butter in a pan and added garlic, rosemary, and thyme to it until it smelled really fragrant (that's when you know it's the right time to add whatever it is you'll be sauteing in it.) I added the shrimp, and only cooked it maybe 1-2 minutes on each side. Shrimp cooks fast, and overcooked shrimp = rubbery and not very enjoyable. Dinner! The shrimp was amazing! Probably because I just sauteed it in a lot of butter, but I'm willing to take the extra calories for awesome flavor. I could take or leave the asparagus to be honest. When I pulled them out of the oven, they were soggy, not that green, and squishy. Since I cook asparagus a lot, I'm going to chalk this up to 1.) it being the prepared kind ready for microwave and/or 2.) having been previously frozen. I probably won't be doing that again. Potatoes needed salt, but when don't they? The salmon was really good as well, and since it was such a simple way to make it, I'll make it again when I'm short on time. Overall, a good dinner (excluding the asparagus!) So if you decide to make this recipe, ignore the deals and just go for the fresh asparagus. Bon appetit!